Thanks for stopping by my blog today. 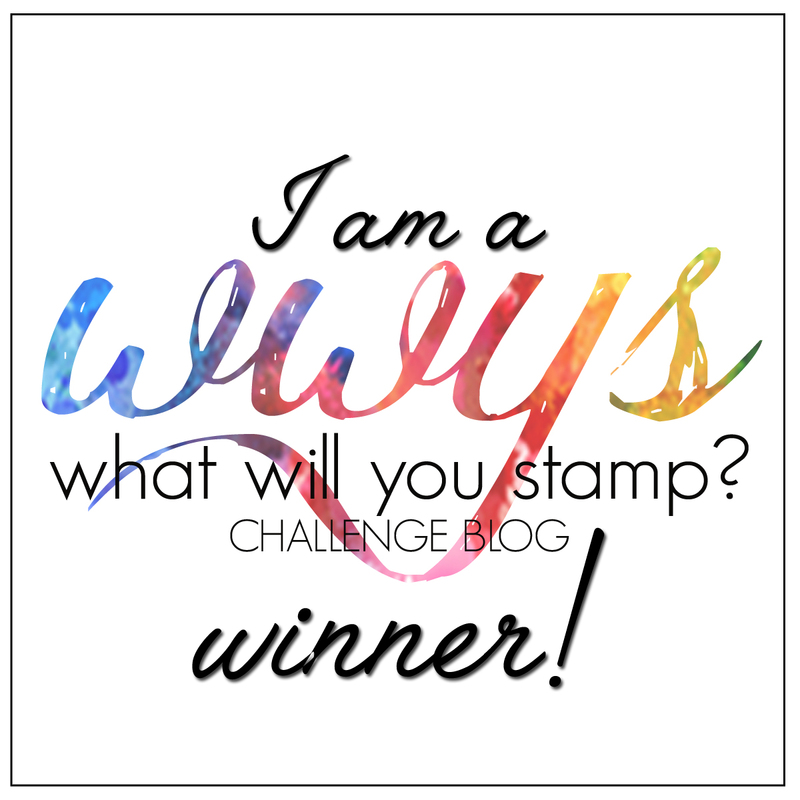 This is my second post in a series of my favourite stamp sets and dies that are retiring from the Stampin' Up! 2018-2019 Annual Catalogue. 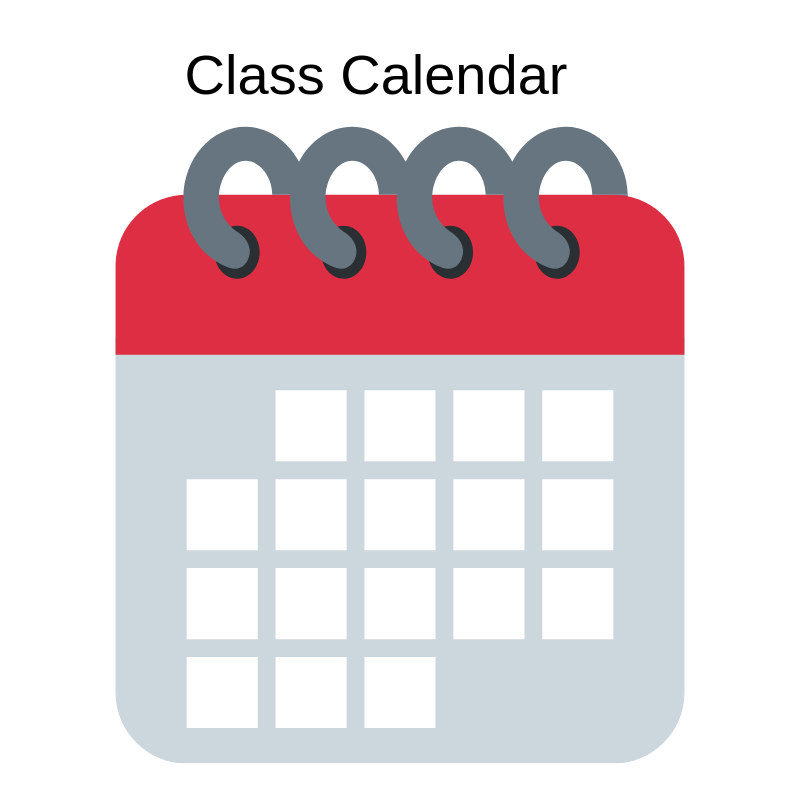 I created these cards for a class I did in 2017. 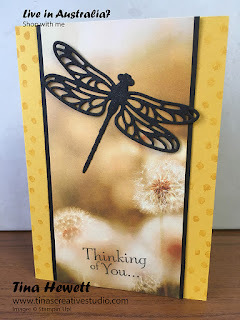 For this card the background for the dragonfly die cut is from a now retired paper pad, and the sentiment is stamped directly onto the paper in Memento ink. You can't see on the photo, but the dragonfly has a subtle sparkle to it, thanks to a Wink of Stella clear glitter brush. This uses another piece from the same paper pad. This time I stamped the sentiment onto a piece of Whisper White cardstock, and used the Classic Label punch to punch it out. Then I layered this onto a strip of Crushed Curry cardstock and used my scissors to snip the ends to match the punched shape. 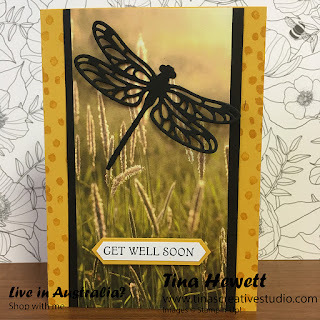 For this card I first stamped around the edges of the card base using one of the images from the Playful Backgrounds stamp set, which is also retiring. 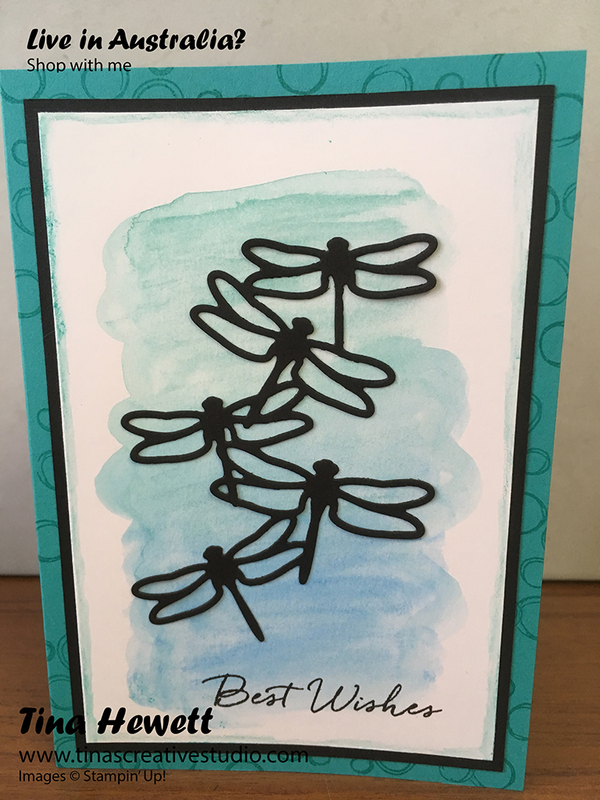 To create the watercolour wash background for the little dragonflies, I first scribbled 2 of the watercolour pencils down the centre of the Shimmery White panel, then used my Aqua Painter with water to blend the colours together and give the wash background. When that was dry I stamped the greeting in black archival ink. 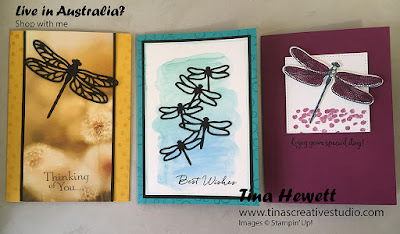 The dragonflies were also shimmered with Wink of Stella glitter brush. For this last card I stamped the dragonfly outline image in Memento black ink, the wings in Rich Razzleberry, and the dragonfly body in Tempting Turquoise (retired) ink. You could use Bermuda Bay or Coastal Cabana. 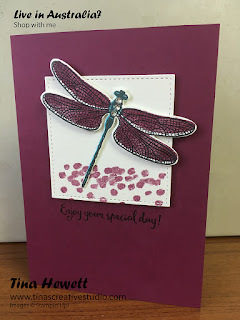 Then I die cut the dragonfly using the matching die and mounted it onto a stitched square with foam Dimensionals. I remember being pleasantly surprised when this image was picked for an Instagram thing (I can't remember what it was, it was so long ago). Anyway, I shall miss this stamp set and the beautiful detailed die cuts. 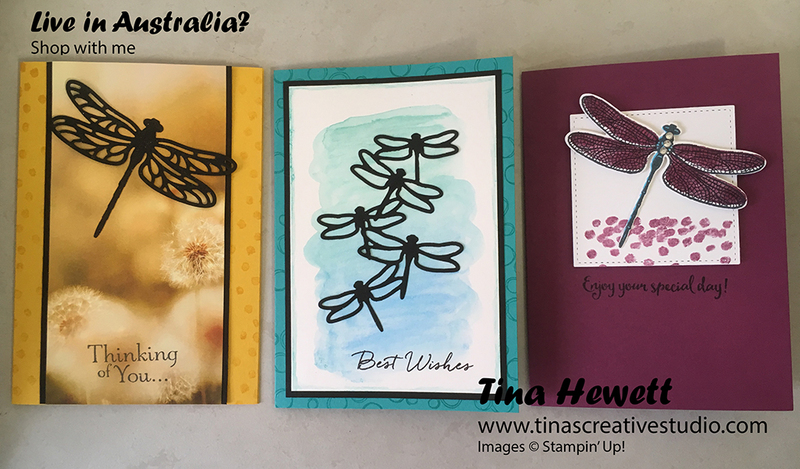 Here is a list of some of the supplies I've used to make these cards, if you'd like to make a purchase, please click on the link to be taken to my online shop. 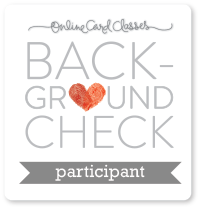 If you use my current host code as in the sidebar, I'll send you a freebie in the mail! 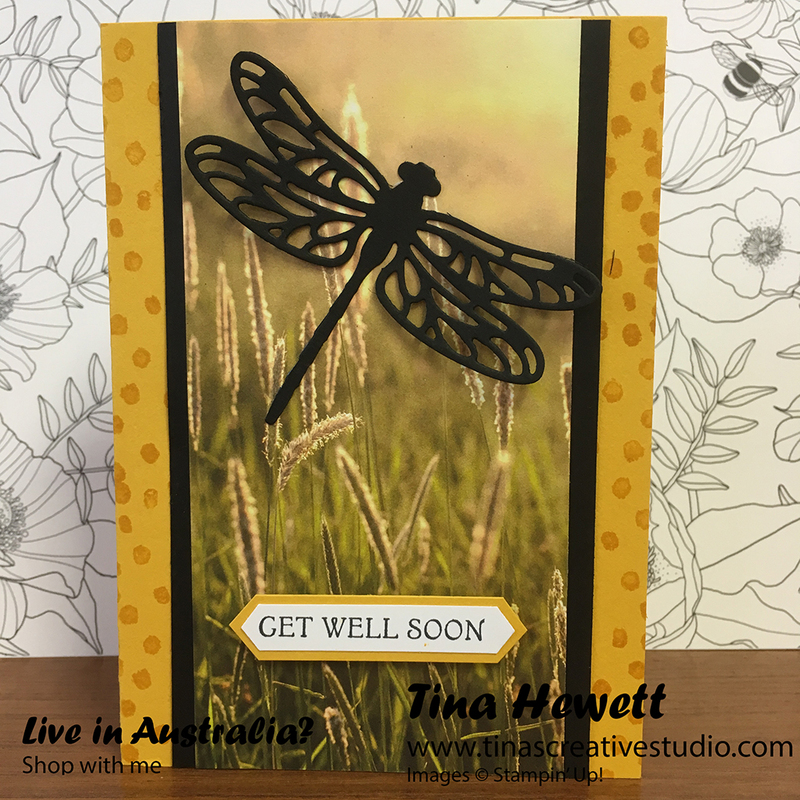 If you'd like to make this card, here is a list of supplies I've used. Just click on any image to be taken to my online shop.